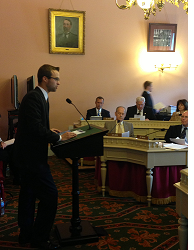 Tax Foundation economist Scott Drenkard testified today before the Ways and Means Committee of the Ohio House of Representatives on HB 5, a municipal tax reform bill which offers a step in the right direction toward a simplified income tax code. His written remarks are available here, with an excerpt below. More analysis on Ohio available here.